The book that Ken Baynes has been working on for around 10 years is now published. In writing the book, Ken has drawn on a lifetime’s research and experience, from his early career leading the Design Education Unit at the Royal College of Art, and from his time as a Visiting Professor in the Loughborough Design School (LDS). Some of the research for the book was funded by LDS and this was presented through four Orange Series publications and associated seminars (see https://dspace.lboro.ac.uk/dspace-jspui/handle/2134/1686 to freely download these papers). 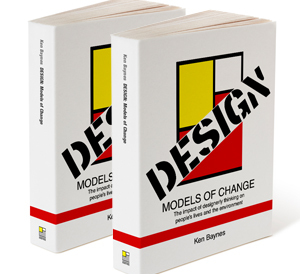 Within these chapters Ken is seeking to answer questions such as: How do designers do what they do? How do architects, engineers, industrial, fashion and graphic designers think? What is it that goes on in their minds that enables them to shape the things that people buy, use and inhabit? And how far do they share their mental abilities with people at large? Is it true that everyone is a designer in their own way? He uses the latest findings from neuroscience and evolutionary biology but also traces the story of designerly thinking back to the early days of homo sapiens sapiens and such momentous changes as the invention of cooking, the Enlightenment and the industrial revolution. Essentially the ability to design depends on the capacity of the human mind to make coherent causal models of our experience and the world. Using these cognitive models we remember the past, interact with the present and imagine the possibility of alternative futures. Design focuses on the future of material culture and so sets out to provide a favourable environment for the evolution of human society. So far so positive. However, Ken also identifies a malignant role played by design in the environmental, social and economic crises now facing the world. How can the energy and creativity of designerly thinking be directed to these key issues? A central aim of the book is to launch a debate on this topic which is crucial to the survival of homo sapiens sapiens. LDP’s recommended supplier is The Great British Bookshop:Great British Bookshop They can also be ordered from good book stores (eg Waterstones) and online book sellers (eg BOOKS etc).